The small AC window unit in my living room was chugging along this afternoon, noisily blowing cool air into the small room yet not doing enough for me personally. My skin was sticky to the touch and my face was shiny. I, needless to say was grouchy, cursing the AC under my breath for not providing the cooling comfort I needed. As I lazily poked around on Facebook looking for something, anything, to get my mind off being hot, I read my friend Kelly’s status. She and her husband, friends I made while living in Italy, were in Venice for the weekend, and in her status she mentioned what they were doing: enjoying a refreshing Spritz and eating cicchetti. I was mostly referring to a casual weekend in Venice, but the Spritz? That would definitely do wonders for my heat induced crankiness. I slipped on my shoes, grabbed my bag and ran around the corner to the liquor store where I bought a bottle of prosecco and a bottle of Aperol, the two ingredients in a Spritz. In Italy, when it was a million degrees outside and there seemed to be no AC anywhere in the entire country, Spritzes, one half Aperol (an Italian bitter apertif) and one half prosecco (italian sparkling wine), garnished with a an orange slice, had been my salvation. Cold, refreshing, and alcoholic, they took the edge off everything— the heat, the national aversion to air conditioning and the italians. As I hastily poured the bubbly and orange liquids into a glass of ice, I felt cooler already. When I sat down to drink it, this time sitting next to the AC while it blew my hair back like a dog’s ears when he sticks his head out the window of a speeding car, all was well with the world again. I had my drink and my AC. Anything else wasn’t my concern. 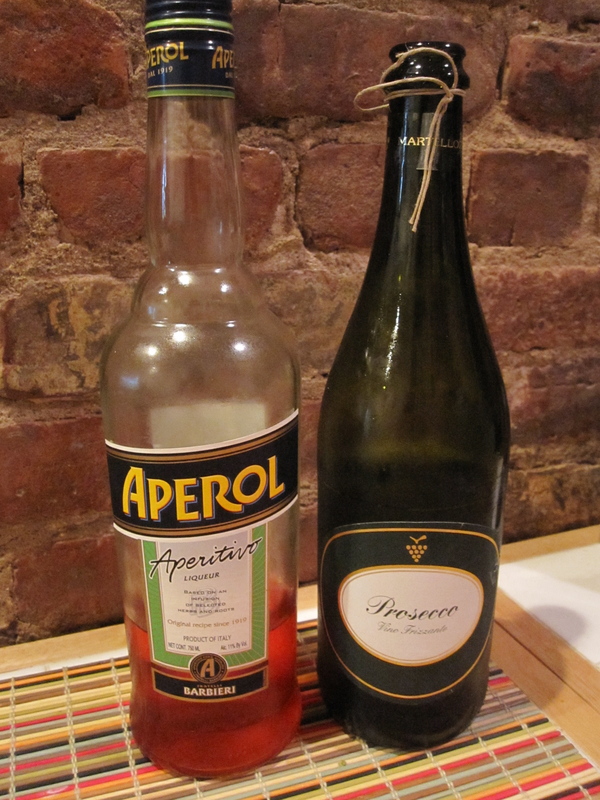 This entry was posted in Drinks and tagged Aperol, Prosecco. Bookmark the permalink. My AC is also a joke. The heat wakes me up. Is it inappropriate to try your spritze trick at 10am? It would be inappropriate NOT to.